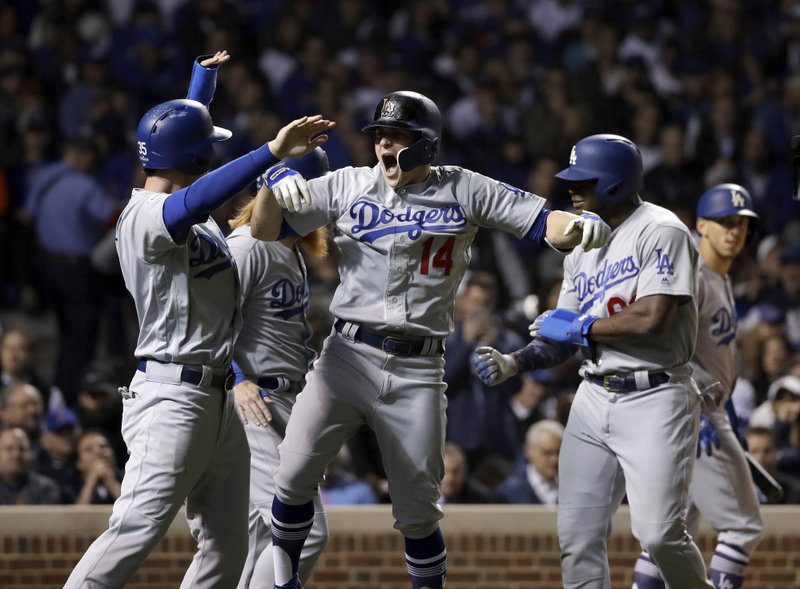 Enrique Hernandez hits three home runs as the Dodgers get to the World Series for the first time since 1988. CHICAGO — Enrique Hernandez put a Hollywood ending on an LA story three decades in the making. He was just OK in his first two starts in this year’s postseason, but Los Angeles’ loaded lineup picked him up each time. Backed by Hernandez’s powerful show in Chicago, Kershaw turned in an efficient three-hit performance with five strikeouts in his sixth career playoff win – matching Burt Hooton for the franchise record. Long playoff runs in each of the last two years and a grueling five-game NL Division Series against Washington seemed to sap Chicago of some energy, and its pitching faltered against sweet-swinging Los Angeles. Jose Quintana was pulled in the third inning of the final game, and the Cubs never recovered. The 26-year-old Hernandez became the fourth player with a three-homer game in a league championship series, joining Bob Robertson (1971 NLCS), George Brett (1978 ALCS) and Adam Kennedy (2002 ALCS). Hernandez’s seven RBI set an LCS record and tied the postseason record shared by four other players who all did it in the Division Series. Troy O’Leary was the previous player to have seven RBI in a playoff game, for Boston at Cleveland in the 1999 ALDS. It was a stunning display for a player with 28 career homers in four seasons also burdened by thoughts of his native Puerto Rico, which is recovering from a devastating hurricane.